I recently had a wonderful experience that I would like to share with you. You see – I have this beautiful friend who works in a flower shop. Her arrangements would make your heart skip a beat, I’m telling you. One fine day back in September, she called me up to say she had an unusual favour to ask of me. She proceeded to tell me about the unsuspecting little creature she had found inside a bouquet at her shop. It was none other than a chubby little monarch caterpillar. Of course I was thrilled to say YES when she asked me if I would care for it. She brought the caterpillar over in a little flower bowl with some sticks and leaves, and a big lush bouquet of milkweed to go along with it. I would later be amazed by how much leaf matter such a tiny creature could rapidly consume. We named our new friend Hortense, it seemed to fit. Over the next few weeks, I learned a lot of new information about monarchs. Watching this creature do its thing, curiosities would naturally arise and pretty soon my whole household was googling monarch facts on a daily basis. 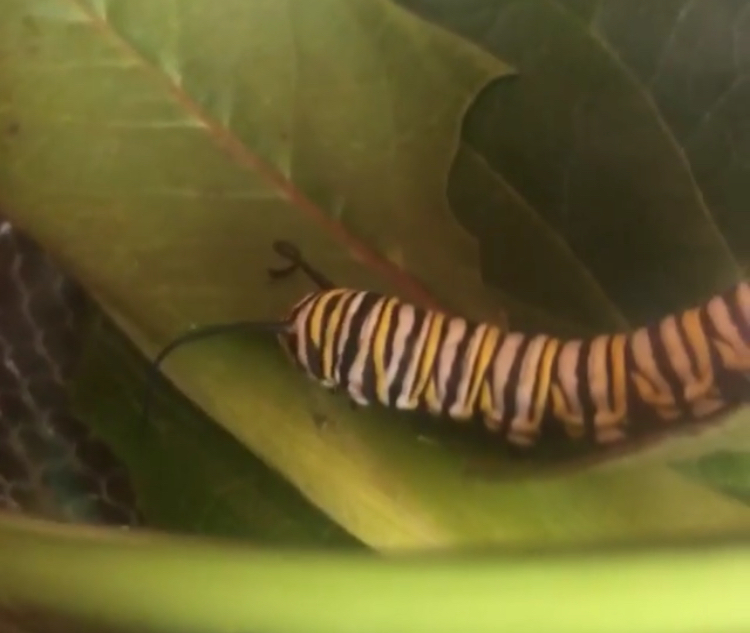 Monarch caterpillars eat only milkweed leaves, and a lot of them. One monarch can defoliate an entire plant during its larval (caterpillar) phase, which is up to about 200 leaves in 2 weeks. That’s a lot of leaves if you’re 2 inches long. I also learned the word defoliate, which is a pretty good word. Monarch caterpillars are very impressive poopers. Very. Must be all the defoliating. The more I researched monarchs, the more I learned how many diseases, afflictions and predators they can encounter in their lifetime. I began to realize the odds were really stacked against this little creature, who had been transported as an accidental stowaway from much farther south, all the way up to Canada, presumably in a refrigerated truck. Thankfully at least food was not an issue, as there were plenty of plants in the truck to defoliate. One day I came home and found that in the few hours I had been gone, Hortense had transformed into a chrysalis. I have no words to describe the wonderment I felt at coming home to find this completely transformed creature. It bared almost no resemblance to its prior form, having liquefied and reformed as a pupa in a matter of hours. 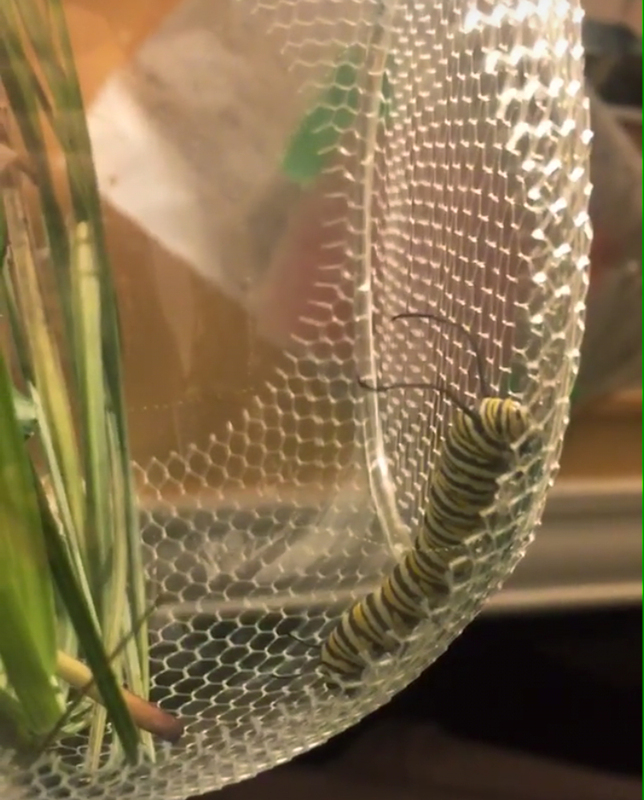 During the 2 weeks of the chrysalis phase that followed, I did more research and learned more about monarchs, especially caring for them in captivity. The more I learned, the more I realized the fragility of this creature’s life and all the potential challenges it could face. I began to temper my enthusiasm with a cautious optimism instead. I really wanted to see Hortense emerge victoriously as a butterfly, but I also realized there were so many ways the metamorphosis could be compromised, and I needed to prepare myself emotionally that she might not make it. This was not an easy task as I had already become quite fond of this little bug. I managed to allow myself to detach from the outcome and focus on my amazement at what had already come into my life and happened. I have Hortense to thank for this lesson as well, which I couldn’t help but extrapolate to other areas of life. I think a lot of us, myself included, are in the habit of focusing on what we have yet to achieve, and we don't always take as much time to reflect on what we have already accomplished. We have so many dreams and goals and aspirations and we put a lot of effort and energy into taking care of things, so feeling like we're not yet where we want to be can lead to frustration. The chrysalis, dotted with gold flecks, slowly turned from a bright, soft green to a dark, translucent hue. One sunny afternoon, a wing moved and POP, the chrysalis opened. Then just like that, Hortense made her way down and out of the chrysalis. She hung below, gently flexing and pulsing. I was so transfixed watching her I almost forgot to capture the moment on camera. Once her wings had dried off and unfurled fully, we slid a chopstick into the bowl, giving her something to crawl out on and hang out. And hang out she did, for many days without moving too much. We were not sure she would actually fly. But we kept feeding her orange nectar every morning and she drank it up and that was encouraging. We all really liked her. This whole thing got me thinking about how watching the processes of nature unfold around us in real time has the power to nudge us beautifully into the present moment. It’s very hard to stay focused on some minor irritation from your day or worry about the future when you come home to check in on your house butterfly. The magic creature just grabs your attention and fills you with wonderment by the simple fact of its existence. The amazing thing is these processes are unfolding around us all the time. They are as common as dirt (and they’re happening in the dirt, too). Even if you live in a city and don’t necessarily have access to old growth forests and wild animals on a daily basis, there are always cues to our connection with nature and environment that we can tap into if we so choose. The truth is, and I felt it so closely with Hortense, we are nature, and we are our environment. There is no place where nature ends and we begin. We are all part of the same ecosystem, growing out of it like fruit popping out of a tree, and then that fruit puts caterpillars on trucks that run on dinosaur bones and… wait, where was I? Ah, yes. The infinite energy of nature and life itself. Pretty cool stuff. Anyway, one warm and sunny October morning, I awoke to find Hortense fluttering around inside the little enclosure we had made for her. It was time for her to go. I took the mesh laundry hamper that was her home carefully out to the balcony and lifted the little flap of fabric I had clipped to the opening. She knew what to do. Just like that, she took off on the breeze, flapping her little wings. Seeing her fluttering through the trees in the neighbour’s yard before disappearing over the next block brings tears to my eyes now as it did then, this precious little creature surviving against all odds and flying away in the sunshine. We were sad to see her go, but so glad to have known her, and we mused about her journey over the next few days. She was smart to leave before this terrible storm hit... I checked the weather in upstate NY, it’s looking clear and sunny – great flying weather.... She must be over the Carolinas by now... She’s probably sipping tequila in Mexico... Keep an eye on the mail, maybe she’ll send a postcard. Over the weeks and months that followed, I crafted a piece of art that would become a love letter, a joyful ode to the lovely Hortense, who in our short time together taught me many things about life, death, resilience, temporality, and the infinite wonder of our beautiful world. Thank you, Hortense. You can view The Mighty Monarch woodcut by clicking here.